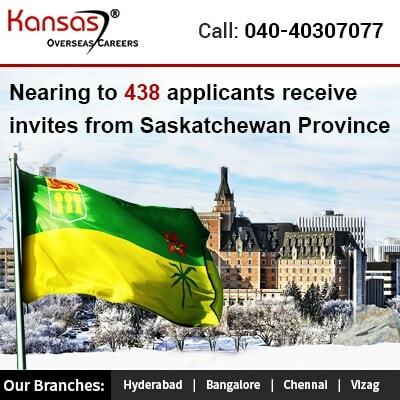 Saskatchewan Province Canada Immigration has issued invites to both Express Entry Candidates and Occupation in Demand category at the lowest required point. For Express Entry the points required were 65 and for Occupation in Demand, the points needed were 66. Nearing to 438 applications were sent invites for the provincial nomination for the above province on September 27th, 2018. The Saskatchewan Immigrant Nominee Program (SINP) made an announcement that, out of the total 438 applications, 225 invitations were sent under the Express Entry program subcategory and the rest 213 invites were issued under the subcategory Occupation in-demand. The Previous draw was conducted on September 21st, 2018, for this draw nearing to 140 applicants received an invite under the Occupation in Demand sub-category. Draw conducted on September 27th , 2018 was the second Expression of Interest (EOI) draw in the week. The candidates after getting an invite from Saskatchewan PNP were permitted to submit a provincial nomination application to Saskatchewan Government. Selected candidates are eligible to receive a bonus of nearing to 600 points in the Comprehensive Ranking System in the Federal Express Entry program selection. This offers them an edge over other candidates in the Canada Express Entry Program. But, for the occupation in Demand candidates, they can now directly apply to the Canadian Government for a Permanent Residency status. For the above two programs, the eligibility requirements were mostly the same hence candidates were not required to have a job offer from the Canadian employer for selection under the Expression of Interest (EOI). The IRCC has set new rules for Canada Immigration for the year 2018, it is planning to invite as many as one million new immigrants with PR visa into the nation by the year 2020. Out of this, nearing to 565,000 PR visas would be issued through Express Entry program or using other allied programs such as Provincial nominations etc. Hence this is the best time, one must consider applying for a Canadian PR. Canada desires to hire a highly qualified working professional to come to its provinces and they must live there and become a part of the economy. Hence, it offers the highest number of points to professional who are young and have a minimum bachelor degree and good amount of years of service.